Follow I-87S (from Upstate NY) or I-84W (from New England) to I-287S around NYC. to take I-81S (connecting just North of Harrisburg). Take I-81, Exit 1B (right two lanes) to I-40. Take I-40 to I-75S in Knoxville. Take I-75 South to Florida. Open mid March - Oct 31, 81 sites. All ages, Tents Only sites: 23, 100 ft max RV length, 286 ft elev, Accepts Big Rigs, 21 pull thrus, 29 full hookups, electric, 29 elec-water hookups, 23, 20/30/50 amp, 14, tables, grill, water, toilets, showers, dump, RV Storage, propane, laundry, firewood, internet, cable tv, pet friendly extra rules, pool, playground. Notes: I-87 toll charges (Class 4H/4 axles) - Albany to I-287 total $22.80. WiFi is weak here at best. Cable TV excellent. at the Howard Johnsons Motel. or perhaps to answer the all important - "How far until we can have a bathroom break?" PA $27 - Valid Sunday through Thursday. Reservations preferred. Notes: The campground is close to the Interstate (I-78) as the crow flies but that's hardly the case by RV. It's a winding path of narrow back roads to get here. 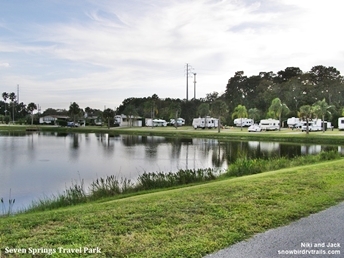 The campground home page boasts of cable TV, WiFi and a full service restaurant. After monkeying with the cable connection for a long time I gave up on it working and used our antenna which was more than adequate. Local WiFi service is non-existent and our paperwork alluded to the fact that the restaurant was only open on weekends. The next morning I visited the "Hostess" in the office to inquire about my misconceptions. She told me that "the WiFi is only receivable near the office area, the restaurant closed two weeks ago and your cable should be working fine!" Pennsylvania Dutch Campground is a Passport America campground which offers half-price camping Sundays through Thursdays but the fine print reads *$3 additional charge for 30/50 Amp, pull thrus, Direct TV and A/C & electric heat. We rate it just "okay" for a stopover. PA - $25 PA valid 1 night. PA valid Sunday - Thursday only. PA is not valid during holidays. Reservations are highly recommended. MUST mention PA at time of making a reservation. Check In: 2PM. Check Out: 11AM. Credit cards accepted. Pets welcome! *Plus tax & 7% resort fee. Rate includes 2 adults and 2 children age 17 and younger, $8 add'l charge per extra person per day. Overnight guests are $12/night for both adults and children. Add'l vehicles are $3/day. Open apr 1 - Nov 15. 100+ RV sites. Big Rig Friendly! Full hookup back-in and pull thrus. 30/50 Amp. Wi-Fi Hot Spots, restrooms with showers, laundry, zero entry swimming pool, gorgeous cave on property, playground, nature/hiking trails, biking, propane, recreation hall, catch/release pond, game room, gift shop, RV supplies, limited grocery items, planned activities and special events, horseshoes, volleyball court, and more! Directions: From Interstate 81, Take Exit 257, turn north onto Route 11 going towards New Market and continue for approx. 4 miles, turn right at the signs onto Endless Caverns Road - continue 1 1/2 miles into resort. Notes: A campground built on the side of a mountain – a Blue Ridge Mountain. The climb is not a problem as we have seen all manner of motorhomes, trailers and toads come and go. The sites are graveled, fairly level and have 30/50A, water and sewer connections. No cable but the antenna brings in the major TV stations. Free Wi-Fi is available near the shower building. Most sites are pull-throughs and all have a picnic table and fire ring. Check-in at the office was pleasant and personable and first-timers are led to their site by a hostess that has a trailer in the campground. Nice shower facility and a coin operated laundry. There is a gate with code access making it a safe as well as a tranquil stopover. Campers receive a discount on the cave tour. Town is approximately 4 miles away with restaurants – including Mexican and Chinese - and service stations. Jalisco Mexican Restaurant on Main Street in New Market is a good value with good food. It sits among Civil War themed art and antique shops. Easy in and easy out. Large pull thru sites with full hook ups (water, sewer, 50 amp electric) make it easy for any size motorhome to come in without unhooking., cable tv, slow but usable WiFi, heated pool and a children's play area. Some sites are shorter than others so make sure they understand the true size of your rig. The park is open all year. Directions: Fort Chiswell RV Park is conveniently located off of I-77 and I-81. Just 3/10 of a mile off interstate 81. Get off exit 80 and take 52 south look for the park on the left hand side. There are several service stations at this exit including a Flying J. Skip the Denny's though bland food and poorly pre;pared. Located on a branch of the Pigeon River, our serene family campground is convenient to all area attractions in a peaceful setting of trees spaced specifically for shade that accommodates local wildlife e.g. birds, squirrels, woodchucks, etc. on well kept lawns with picnic tables that are bordered by excellent roads providing pull-through-spots with full RV hookups. Our amenities include free WiFi/TV (18 channels), swimming pool, bathhouse (showers, commodes, sinks, electric outlets) and when needed, a coin-operated Laundromat and small supply store. Directions: From I-40 take Exit 407, then 5 miles South on HWY 66 (Winfield Dunn Parkway). Get in the right hand lane as soon as possible on HWY 66 for right turn into the park. Welcome to Dolly Parton's hometown! One of our favorite campgrounds thus far on this route. Friendly folk check you in and show you to your site. Always a smile and a wave when they see you. The "pull-thru" sites are actually back-to-back sites so if you need a pull-through it would behoove you to call ahead and reserve. The beauty of the campground is its closeness to all of the action without having to drive through it to set up. Drop your rig and explore the miles of shows, restaurants and other activities - even a Bush Beans Museum. Make your first stop at a Walmart or other supermarket and pick up some free coupon books to save $$$ on many things during your stay. Big rigs with slide-outs welcome, 54 Gravel pull-thrus (30X70) with full hook-ups, 28 Back-in sites with full hook-ups, 30 & 50 Amp Service, Complimentary Cable TV, Park store (groceries, ice & RV supplies), Laundromat. Directions: Harvest Moon RV Park is located midway between Atlanta, Ga. & Chattanooga, Tn. off I-75, Exit #306. From Ex. #306, head West 1/4 mile. Turn left at the Waffle House - they are just 100 yards down the street on your right. One of our favorite campgrounds on this route. Friendly owner and hostess. Service with a smile, charming Southern drawls and maybe a fresh bag of popcorn at check in. The Park is easy to negotiate even with the largest rig. The pads are gravel and level with FHU at the front and back of each site. Free cable but the WiFi is really hit and miss. No charge for the laundry facility. Quite a few permanent or Seasonal rigs but their areas are neat as is the rest of the Park. There is a nice sized pool and the laundry and shower facilities are neat. The activity center is a former chapel on the property. Fuel, fast food, a Waffle House and a Cracker Barrel are all available at this exit off I-75. We recommend a visit for the lunch buffet at the Adairsville Inn Restaurant. Friendly folks and really good homemade Southern dishes. It is now one of our favorite restaurants we have found on our East Coast Snowbird routes. Visit historic downtown Main Street and the Adairsville Rail Depot Age of Steam Museum - built in 1847 - to learn the real story behind the Civil War's "The Great Locomotive Chase" that happened through Adairsville. They have a three-day Great Locomotive Chase Festival annually in early October. PA- $25. Open year-round! PA is valid for 6 nights. Please see management for discounts on longer stays. Discounted weekly and monthly rates available. Credit cards accepted. No smoking. Pets welcome. *Rates include tax. $2 additional fee per night when using credit card. Directions: Located 14 miles from Warner Robins and 29 miles from Macon. Park is located less than half a mile off of I-75, exit 136. Going South - Turn RIGHT off of the exit, the campground is on your LEFT. Easy off/on I-75 at exit 136. An older park but well kept. Sites are black-top pads with grass. Be sure to give your rig's true size when making a reservation as some transient sites are short. Nice laundry and shower facility. Pool was empty when we stayed (late Oct). Grillmasters BBQ is within walking distance next door and will allow a 10% discount to campers. Cheap gas is also closeby. A Walmart, supermarket and all types of fast food places also nearby. Not a lot of local attractions other than the State Fairgrounds and Agricultural Center is in Perry. A drive through the countryside will take you past cotton fields and pecan orchards. Amenities: 130 sites. Large Paved Pull-Thru Sites, 30/50 Amp Service, Internet: Wireless/DSL, no cable, Pool, Laundry & Vending, LP Gas, Ice, Night Security, Flea Market Adjacent. Directions: Get Off At Exit 5, Lake Park,Georgia. Go East 1 Block, Turn Right (south) On Mill Store Road & past the Outlet Center. Follow Mill Store Road 3/4 of A Mile and Eagles Roost Is On The Left. Notes: Outlet stores nearby and a Weekend Flea Market adjacent to the campground. and Rodeo Mexican Restaurant, 1219 Lakes Blvd, 229-559-3320, Lake Park, GA are very good. Denny's/Flying J, 7001 Lake Park-Bellville Rd, Lake Park, GA for fuel. Though we enjoy this campground with its mighty oaks and Spanis moss there are also two other nice campgrounds near this exit that we have visited and think they are very suitable for stopovers. 58 sites. Make reservation. PT, FHU, 30/50 A, WiFi, Lake. Moody AFB campground open to the public. Directions: GA Exit 5 from I-75, .15 mile to left on 376, .9 mile to left on loch laurel rd, 1.5 mile to grassy pond, then .35 to park. Just on the West side of I-75 at Georgia Exit 5 making it an easy off/on stopover for a night or longer. Check-in is with the cashier in the Camping World store which is just North of the campground. It's nicely layed out with many more sites than we had anticipated . Note: Prices and discounts are always subject to change - it's always best to phone ahead. Visit our BLOG to see what we are doing currently and our past adventures. First time visiting us? 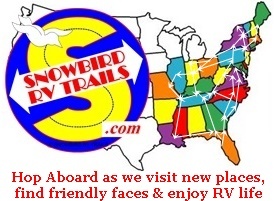 Click More about Niki, Jack and Snowbird RV Trails. More Photos on Our Pinterest Page.